Written by avid Nepal trekkers, Marit Bakke and Olav Myrholt, Adventures in Nepal is one of the most important books ever compiled about trekking in the Nepal Himalaya. As anyone who has been to Nepal will know, the two most popular regions of the country for trekkers are the Everest and Annapurna trails. However, there are many other equally stunning areas of the country, sometimes quiet and remote, always alluring and charming, towered over by yet more dazzling mountains. These long-overlooked regions deserve the attention of a greater audience. Areas such as Manaslu and Mustang are rapidly becoming the talk of Kathmandu and of discerning trekkers looking for a new adventure. Easily accessible areas like Ganesh Himal, Langtang and Rolwaling do not rely on flights and hold enchanting secrets that few are aware of — pristine forests, superb wildlife, quaint villages and exotic monasteries, along with fantastic peaks and glaciers attractive to both trekkers and climbers. Sublime and inspiring, Dolpo is another area that captivates all who dare to trespass on to the high Tibetan plateau with its unique culture. If these destinations do not hold enough for a lifetime, there is the east of Nepal, with the staggering mountain grandeur of mighty Kanchenjunga and the little-known gem of Makalu, one of these scribes’ favourite treks, a high and wild paradise. The final frontier of Nepal is the Far West, where life continues almost unchanged over centuries. The remote peaks of Api, Saipal, Nampa, holy Om Parbat and Kanjiroba are the equal of any of the more well-known peaks. The cultural attractions of Nepal are varied and intriguing. In its first few pages, this book introduces facets of the geography, environment, climate, culture, people, religions and of course some enlightening political background. It also includes useful hints about the conduct that visitors should adopt and notes how their presence can be a benefit to a society that is very different, yet in many ways an inspiration. No one can visit Nepal and not be changed forever. Tourism is a two-way process, where both sides can learn from each other: it should be an engine for greater awareness and tolerance in the world. Perhaps uniquely, Adventures in Nepal is set out with simplicity of use in mind. 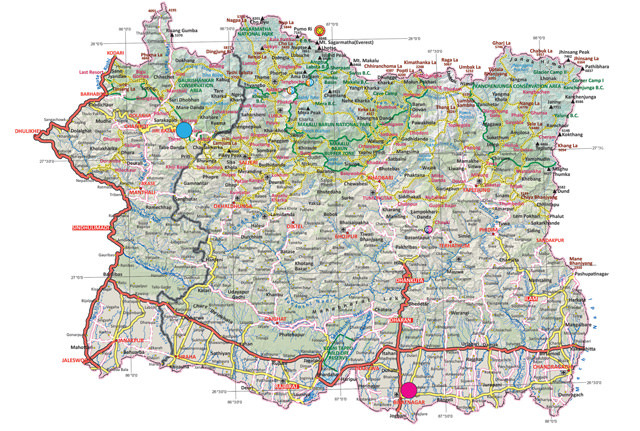 Treks are arranged not by regions, but by the number of days that each trekking route requires. Itineraries vary from 1–2 days up to several months for the Great Himalaya Trail route. This is really useful for all when planning, because most trekkers are sadly limited by holiday time. Visitors will soon realise that the concept of time in Nepal is far more relaxed and in stark contrast to that familiar to most of the busy, go-getting, materialistic world. The mesmerising trails and panoramic views soon wash away those fixated habits of elsewhere, keeping track of time becomes something almost alien for a few brief days or weeks. Life is reduced to walking, eating and sleeping, the senses heightened and focused only on nature and its grandest designs. After you have finally decided which area of the country to explore, why not seek out a guidebook specific to your chosen destination? Also produced by Himalayan Map House, Himalayan Travel Guides are specific guidebooks to most of the areas presented in this book, like the unique guide to the Annapurna Circuit written by Andreas de Ruiter and Prem Rai, as well as guidebooks written by us. 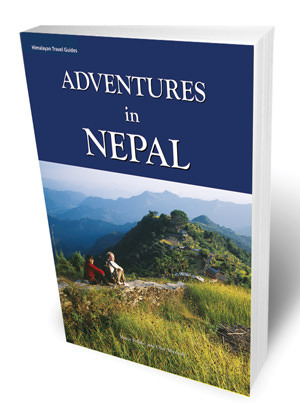 Adventures in Nepal is your introduction to the little known parts of Nepal and its fabulous Himalayan peaks. Siân Pritchard-Jones and Bob Gibbons met on a trek from Kashmir to Ladakh in 1983 and have been writing Himalayan guidebooks ever since. "The state of our nation state"